The program you will see tonight dramatizes the lives of eight real women. In the autobiography of Maria, names and identifying details have been changed to protect the privacy of the woman represented. Kathy is the author of the program. 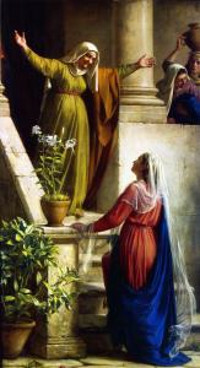 Mary is her mother, and Hannah is her ancestor. The other four women depicted are scriptural persons, and we invite you to look up the references contained in your program for the factual accounts. Song: “Come Follow Me,” Hymn 116. I am Mary. When the angel Gabriel first appeared to me, I was troubled and afraid. I felt so young and insignificant, and I did not understand why an angel would want to visit me. When he explained that I had found such favor with God that I had been chosen to be the mother of the Son of God, I was astonished. The Holy Ghost filled my heart. I knew what the angel proclaimed would truly come to pass and that God was, indeed, giving me a great honor by so choosing me. I had faith that God would watch over me and help me with this tremendous responsibility, but I felt so unprepared, both emotionally and spiritually. Not only that, but I was perplexed as to how I would tell others about this marvelous thing that would happen to me. Would they rejoice with me or scorn me? How would I react? Desperately needing time to ponder the angel’s words and prepare myself for what was to come, I traveled with haste to the home of my kinswoman Elizabeth, who, the angel had informed me, was with child in her old age. I greeted Elizabeth in gladness and relief. I remained with Elizabeth for three months. When I returned to Nazareth, I felt as if I truly could fulfill the Father’s trust in me and be the mother of His Holy Son. My name is Mary. I woke up early that Saturday morning in June feeling excited and happy. Kathy and Steve had arrived the evening before with the kids and were planning to baptize Christina that morning. I couldn’t wait to give Christina the cute little baptismal coloring book I had found. I felt a twinge of worry. Would Rachel be upset when she found out she would have to wait two years for her coloring book? As I finished getting ready to go, a terrible thud sounded from the shower. Even before I could open the shower door, I saw that Gene, my husband, had fallen. Panic rose within me as a realized he was unconscious. I ran into the hallway, crying out to my son-in-law for help. I was so upset, I couldn’t think straight. My one good eye was blurry, and I could barely see. I didn’t know what to do. I prayed that Gene would be all right. Steve pulled Gene out of the shower and began giving him CPR. Even now, I thank Heavenly Father that Steve was there. I could never have pulled Gene out of that shower by myself. Kathy sat down with me on the bed. Terri, who was also visiting with her children, called 911. The paramedics arrived in an instant, it seemed. They told us that Gene had had a heart attack. An hour later, I found out that he was dead. Dead! At age 53. As heartsick as I was, however, I felt very blessed. Steve and Kathy had not visited in many years, yet they were there when I needed them the most. Had they not been visiting, Terri would not have been there that morning either. I felt very humbled to realize the Lord loves me so much that He made sure my son-in-law and two of my daughters were with me the morning Gene died. I don’t know how I would have made it through that horrible morning without them. My family gathered around me for a short time, and the members of my ward embraced me with their love and support. Eventually, however, I had to move forward on my own. What was I going to do? Gene had always loved me so much and had taken such good care of me. For 34 years, he had been my best friend. How could I go on without him? Gene left we well off financially, but I struggled with government bureaucracy for many weeks before I actually begin receiving the insurance money. In the process, I gained an ability to assert myself that I had never had before. Not wanting to be dependent on anyone, I found out that I could get a driver’s license, despite the fact that I’m blind in one eye. (I shocked my family with this information, I’m sure!) I can’t drive when my good eye is blurry, of course, but at least I have the freedom to get out on my own occasionally. Once I finally did get Gene’s insurance money, I avoided investing it for many months. I didn’t know anything about investments, so I took a class. In a matter as important as this, I didn’t want to take the chance that I would make a terrible mistake out of ignorance. Along with the investments’ class, I began taking Institute classes at the church. This was an exciting thing for me. All of my children had gone to early morning seminary and had taken religion classes in college, but between joining the Church as a mom with small children, serving in callings, and working, this was the first time I had felt free to take those religion classes myself. I’m learning so much, and I absolutely love them! I have spent some of the insurance money redecorating my home. Gene and I had wanted to do a lot of this work for a long time. I can’t tell you how much it lifts my spirits to look around and see the new carpet and the freshly painted walls. I took down all of the heavy old drapes and put up blinds. Now my home is full of light, and I can see so much better. My dear friend Florence bent over backwards to spend time with me during those early days without Gene. She and her husband were in charge of the Single Adults program in my stake, and she encouraged me to attend the firesides held for the singles on Sunday evenings. I was reluctant at first, but eventually I got to the point where I didn’t miss a fireside. I made many new friends among the single sisters in my stake, neat women I’ve come to love and admire. One friend in particular, Joyce, looked for ways to help me. There were days when I was so overwhelmed by loneliness that I would kneel by my bed crying and not be able to get up. I would pray with all my heart to the Lord to ease my loneliness. Sometimes one of my daughters would call. More often, though, Joyce would call or stop by. She is so good to me. Whenever I have a bad day, I think of her and all she’s been through. As Joyce reaches out to me, I can’t help but reach out to her. Song: “Look Inside,” by Julie S. Anderson and Dennis L. Crockett, published in A Song of the Heart. For the complete program, please see Let Us Walk in the Light of the Lord.